A survey exhibition of one of the famous ‘Petyarre’ sisters. Nancy Kunoth Petyarre was an Anmatyerre women and senior artist. She was also one of the acclaimed seven Petyarre sisters, all artists of note and internationally renowned. Featuring paintings spanning more a decade, this exhibition showcases the various styles and stories for which Nancy was known. Nancy Kunoth Petyarre was born c1938 ‘out bush’ about 350 km’s north-east of Alice Springs in Central Australia. She did not start painting until she was in her 40s, had no formal education and knew almost nothing of Western art. Her primary dreaming was Arnkerrthe, the Mountain Devil Lizard. Many of her works depict the lizard through compositions of delicate dotting, replicating the skin of the lizard. There is a fragility to her work that is countered by the strength of form and use of striking colour. Other works in the exhibition include ‘Awelye’ or Body Painting story. The iconography portraying the dreaming stories designs women paint onto their bodies for ceremonial purposes. Nancy was part of the original group of women to participate in batik workshops and subsequently acquired by The Holmes a Court collection. Her artwork is also in collection at the National Gallery of Australia. Nancy passed away 2009. Her death saw the passing of both a talented artist and senior cultural custodian of the Anmatyerre people. 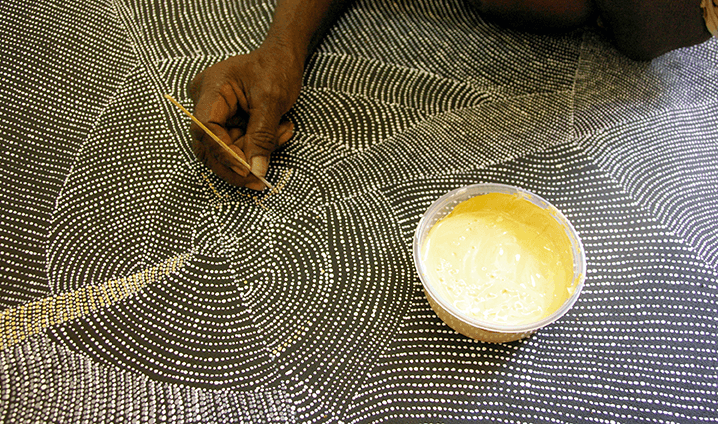 This exhibition is an homage to one of Central Australia’s most skilled and charismatic artists. A Director’s Talk will be held in the gallery on Saturday 2nd March from 2pm. There will be no opening night for this exhibition. The gallery is open 6 days a week from Monday to Friday 10am to 5:30pm and Saturday 10am until 5pm, with onsite parking available. Mitchell Fine Art can also be followed on Facebook and Instagram. To enquire on any artworks, phone 07 3254 2297 or email admin@mitchellfineartgallery.com.